FILLING BLANK SPACES: THE BIG ANNOUNCEMENT: SINGULARITY! 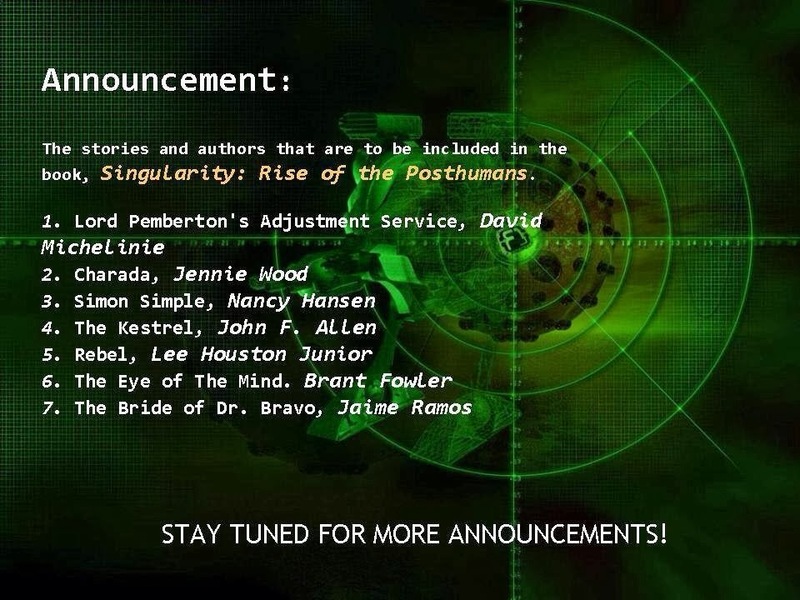 A short story I wrote on spec(ulation) last year has been accepted for the anthology SINGULARITY: RISE OF THE POST-HUMANS! Jennie Wood (Flutter, FUBAR, etc. ); Nancy Hansen (Fortune's Pawn, Prophecy's Gambit, etc. ); John F. Allen (Ivory Blaque, Knight Ranger, etc. ); Brant Fowler (Wannabez, Gonzogoose, etc. ); Singularity concept creator Jaime Ramos (numerous short stories); and my humble self. Yet my inner "fan boy" is as excited as can be about being in a publication with the one and only David Michelinie, a noted comic book writer who has done some serious work for The Big 2 (DC and Marvel)! Singularity itself is a steam punk, science fiction, superhero anthology featuring a shared world of the possible future with discord regulators, an evil queen, the creeping green, and so much more! There will definitely be more announcements about this project as it nears publication later this year! For now, I'll see you around the Internet.